In some Christian churches, a reader is responsible for reading aloud excerpts of scripture at a liturgy. In early Christian times the reader was of particular value due to the rarity of literacy. In the Latin Rite of the Catholic Church, the term "lector" or "reader" can mean someone who in a particular liturgy is assigned to read a Biblical text other than the Gospel. (Reading the Gospel at Mass is reserved specifically to the deacon or, in his absence, to the priest.) But it also has the more specific meaning of a person who has been "instituted" as a lector or reader, and is such even when not assigned to read in a specific liturgy. This is the meaning in which the term is used in this article. The reader is appointed for a function proper to him, that of reading the word of God in the liturgical assembly. Accordingly, he is to proclaim the readings from sacred Scripture, except for the gospel in the Mass and other sacred celebrations; he is to recite the psalm between the readings when there is no psalmist; he is to present the intentions for the general intercessions in the absence of a deacon or cantor; he is to direct the singing and the participation by the faithful; he is to instruct the faithful for the worthy reception of the sacraments. He may also, insofar as may be necessary, take care of preparing other faithful who are appointed on a temporary basis to read the Scriptures in liturgical celebrations. That he may more fittingly and perfectly fulfill these functions, he is to meditate assiduously on sacred Scripture. Aware of the office he has undertaken, the reader is to make every effort and employ suitable means to acquire that increasingly warm and living love and knowledge of Scripture that will make him a more perfect disciple of the Lord. Canon 1035 of the Code of Canon Law requires candidates for diaconal ordination to have received and have exercised for an appropriate time the ministries of lector and acolyte and prescribes that institution in the second of these ministries must precede by at least six months ordination as a deacon. Instituted lectors, who are all men, are obliged, when proclaiming the readings at Mass, to wear an alb (with cincture and amice unless the form of the alb makes these unnecessary). Others who perform the function of lector, but who are not instituted in the ministry of lector, are neither required nor forbidden by universal law of the Latin Church to wear an alb: "During the celebration of Mass with a congregation a second priest, a deacon, and an instituted reader must wear the distinctive vestment of their office when they go up to the ambo to read the word of God. Those who carry out the ministry of reader just for the occasion or even regularly but without institution may go to the ambo in ordinary attire, but this should be in keeping with the customs of the different regions." Like other lay ministers, they may wear an alb or "other suitable attire that has been legitimately approved by the Conference of Bishops". Neither the England and Wales episcopal conference nor that of the United States has specified a particular alternative attire., while in the dioceses of the United States of America, a cassock and surplice may be worn as "appropriate and dignified clothing"
The General Instruction of the Roman Missal speaks as follows of those who, without being lectors in the specific sense, carry out their functions at Mass: "In the absence of an instituted lector, other lay people may be deputed to proclaim the readings from Sacred Scripture, people who are truly suited to carrying out this function and carefully prepared, so that by their hearing the readings from the sacred texts the faithful may conceive in their hearts a sweet and living affection for Sacred Scripture." The General Instruction thus makes no distinction between men and women for proclaiming the scriptural readings in the absence of an instituted lector. In its sections the same document lists the lector's specific duties at Mass. Traditionalist Catholic organizations such as the Priestly Fraternity of St. Peter, the Institute of Christ the King Sovereign Priest and the Personal Apostolic Administration of Saint John Mary Vianney are authorized to use the pre-1973 rite for their members who receive the office of lector. The Society of St. Pius X (SSPX) and other traditionalist Catholic bodies in dispute with the Holy See, such as sedevacantists, use it without seeking authorization. 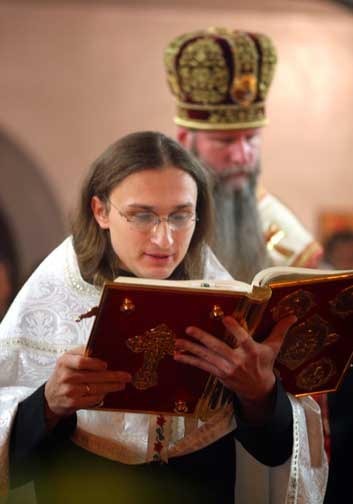 In the Eastern Orthodox Church and in the Eastern Catholic Churches of Byzantine tradition, the reader (in Greek, Ἀναγνώστης Anagnostis; in Church Slavonic, Чтец Chtets) is the second highest of the minor orders of clergy. This order is higher than the Doorkeeper (now largely obsolete) and lower than the subdeacon. 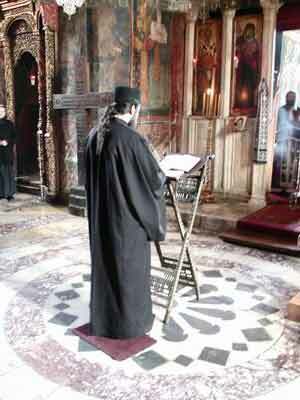 The reader's essential role is to read the Old Testament lessons ("parables") and the Epistle lessons during the Divine Liturgy, Vespers and other services, as well as to chant the Psalms and the verses of the Prokimen, Alleluia and certain antiphons and other hymns during the divine services. Due to this fact, it often falls to the reader within a parish to construct the variable parts of the divine services according to the often very complicated rules. This can lead to a very intimate knowledge of the structure of and rules pertaining to the services. There is a special service for the ordination of a reader, although in contemporary practice a layman may receive the priest's blessing to read on a particular occasion. Immediately before ordination as a reader, the candidate is tonsured as a sign of his submission and obedience upon entry into the clerical state. It is a separate act from ordination. The tonsure is performed only once, immediately prior to the actual ordination of a reader, which the ordination rite refers to as "the first degree of priesthood". However, it is not the means whereby a person becomes a reader. Readers, like subdeacons, are ordained by Cheirothesia - literally, "to place hands" - whereas Cheirotonia - "to stretch out the hands" - is practised at the ordination of the higher clergy: bishops, priests and deacons. It is through ordination - not the tonsure - that one is made a reader or subdeacon; this is highlighted by the fact that the tonsure is performed only once and is not repeated before the ordination of a subdeacon. The confusion has arisen by the common reference to a man being "tonsured a reader" which, while widespread, is not technically correct. The office of a reader subsumes that of a taper-bearer, and the service of ordaining a reader mentions both functions. After being tonsured, the reader is vested in a short phelon, which he wears while reading the Epistle for the first time. This short phelon is then removed (and never worn thereafter) and replaced with a stikhar, which the reader wears thereafter whenever he performs his liturgical duties. This practice is not universal, however, and many bishops and priests will allow a reader to perform his function dressed only in a cassock or (if a monk) a riassa. Often, a bishop will decree what vesting practice he wishes to be followed within his own diocese; for an example, see holy-trinity.org, section VIII. Byzantine icons often show readers and church singers wearing a stikhar-like garment (more loose and flowing than the modern stikhar) and a pointed hat with the brim pulled out to the sides. This distinctive garb is now obsolete. In Eastern Thrace, during the Ottoman period and prior to the tragedy of 1922, some lay people were selected through symbolic tonsure and Cheirothesia to receive the ecclesiastical blessing and rank of ''Anagnostis'' [el] not only because of their literacy but also in recognition of their philanthropic and benevolent patronage of the Church and Orthodoxy. Most adopted "Αναγνώστης" (Anagnostis) as their given name, and this name was subsequently given as a baptismal name to their male grandchildren. Minor orders were discontinued in the reformed Church of England. The modern office of reader was introduced in 1866 and is distinct from the traditional minor order of reader. It is the office of a licensed lay minister and, for this reason, a person holding the office is referred to as a "lay reader" in many parts of the Anglican Communion. After a period of theological training (often, in the case of the Church of England, three years of evening classes), a lay person is licensed to preach and lead public worship. A reader is not a member of the clergy and cannot preside at the Eucharist, officiate at marriages, absolve or bless. A reader is licensed to lead non-sacramental worship (including, in some cases, funerals), may assist in the leadership of eucharistic worship and may preach. Anglican readers in some countries often wear a blue tippet with choir dress. In the United Methodist Church in the United States, similar to the Anglican office, a Certified Lay Minister is a certified lay servant, certified lay missioner (or equivalent as defined by his or her central conference), who is called and equipped to conduct public worship, care for the congregation, assist in program leadership, develop new and existing faith communities, preach the Word, lead small groups, or establish community outreach ministries as part of a ministry team with the supervision and support of a clergyperson. The role of Certified Lay Minister is intended for missional leadership in churches or other ministry settings as part of a team ministry under the supervision of clergy, and they are assigned to a local church by the District Superintendent, unlike ordained clergy who are appointed by a bishop. ^ The term "lector" is used in preference to that of "reader" in the official English text of the General Instruction of the Roman Missal ("reader" is found in no. 352 of this document, but not elsewhere), but "reader" is used in the English version of the Post-Synodal Apostolic Exhortation Verbum Domini, which capitalizes "Reader" to indicate an "instituted" reader or lector. ^ "Pope Paul VI - Ministeria Quaedam". ewtn.com. ^ "Code of Canon Law: text - IntraText CT". intratext.com. ^ "Chapter III: Offices and Ministries in the Celebration of the Liturgy of the Word within Mass". catholicliturgy.com. ^ "General Instruction of the Roman Missal (England and Wales), 339" (PDF). liturgyoffice.org.uk. ^ "Chapter VI: The Requisites for the Celebration of Mass". usccb.org. ^ "101". usccb.org. Retrieved 10 April 2018. ^ "194-198". usccb.org. Retrieved 10 April 2018. ^ "Only in Institutes of Consecrated Life and Societies of Apostolic Life which are under the Pontifical Commission Ecclesia Dei, and in those which use the liturgical books of the forma extraordinaria, is the use of the Pontificale Romanum of 1962 for the conferral of minor and major orders permitted" (Instruction on the Application of Summorum Pontificum, 30 April 2011, 31). ^ "The Sacramental Life of the Orthodox Church - Liturgy & Worship - Greek Orthodox Archdiocese of America". www.goarch.org. Retrieved 10 April 2018. ^ "HTC: Liturgical Order #1". holy-trinity.org. ^ "Icon Directory, lower left corner". oca.org. Retrieved 10 April 2018. ^ "Anglican Readers' website - Home Page". anglican.org.